The following are resources my clients turn to support their websites. The services are high quality and a good value. Each aff link opens in a new browser window. There is plenty of awesome below. Is there something that should be added to the list? Let me know in the comments. Simplify password management and filling in web forms. I could not work without this software. Really. For high quality hosting try Site Ground. For inexpensive hosting try Host Gator. For inexpensive hosting try Blue Host. Need photography? Most are just a couple of dollars. Good quality photos. Need photography? Prices range from fifty dollars up to thousands. Very high quality photos. SEO Research Tools, Community and Education. SEOmoz. Want to learn SEO? Learn from the best. The social media management and monitoring solution for professionals. Get listed in the major online and mobile directories. Great for Local SEO. Submit your web site to the oldest Internet Directory on the web. Join PayPal and accept credit card payments instantly. Follow this link to buy your domain names. Follow this link to sign up for your hosting account here at JBS Partners. The most advanced WordPress theme on the market. The Digital Sales Engine and Lead Generation in one. 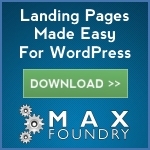 WordPress landing page solution from CopyBlogger Media. Genesis (Published by StudioPress) is the WordPress theme framework solution from CopyBlogger Media.